1954: Mathematician Alan Turing commits suicide by cyanide poisoning, 18 months after being given a choice between two years in prison or libido-reducing hormone treatment as a punishment for homosexuality. Turing was instrumental in the British intelligence services during World War II and he is widely considered the father of computer science. The queer circumstances of Alan Turing’s death were hidden for 20 years until the Gay Liberation Front broke the silence. The convenience of our computerized world is built on oppression of the LGBT people who helped build it. For more details, read Alan Turing: Gay codebreaker's defiance keeps memory alive (BBC News). 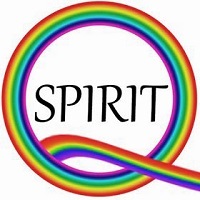 1955 – The Daughters of Bilitis (DOB) was founded in San Francisco in 1955 by four lesbian couples (including Del Martin and Phyllis Lyon) and was the first national lesbian political and social organization in the United States. The group's name came from "Songs of Bilitis," a lesbian-themed song cycle by French poet Pierre Louÿs, which described the fictional Bilitis as a resident of the Isle of Lesbos alongside Sappho. DOB's activities included hosting public forums on homosexuality, offering support to isolated, married, and mothering lesbians, and participating in research activities. These blog entries, along with the pics' are absolutely priceless! Thanks, Trudie! These comments of encouragement help because I'm starting to feel overwhelmed by covering all the horrors along the LGBT Way of the Cross in one week. I'm glad that you're finding a way to type comments, even with a broken wrist. Healing prayers for you. Andy, I am also glad that you are still here, alive and bringing art, music and queer joy into the world! 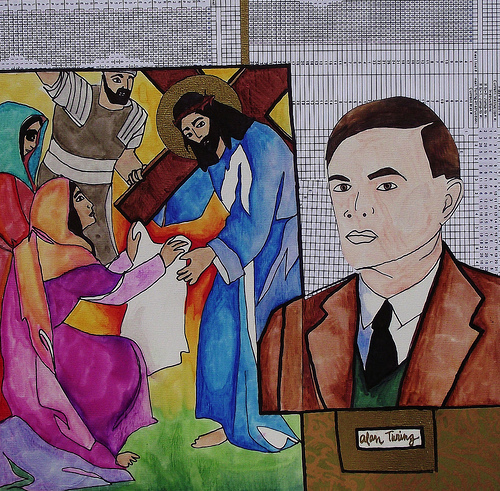 I didn’t know much about Alan Turing until I saw him in this LGBT Station of the Cross. His life and death do have much to teach us. Maybe young people, the “digital natives” raised on the Internet, feel a special connection to his work as a computer scientist.